Title: 08/18/1987 - Applicability of the HCS to manufacturers of steel coils. This is in response to your letter of July 10, regarding compliance with the Occupational Safety and Health Administration's Hazard Communication Standard (OSHA), 29 CFR 1910.1200. The Hazard Communication Standard defines an article as a manufactured item: (i) which is formed to a specific shape or design during manufacture; (ii) which has end use function(s) dependent in whole or in part upon its shape or design during end use; and (iii) which does not release, or otherwise result in exposure to, a hazardous chemical under normal conditions of use. Accordingly, manufacturers or importers must do their best to anticipate the uses of their products and determine whether downstream employees can be exposed to a hazardous chemical. If such an exposure does occur or has the potential to occur then the product could not be considered as an article. Articles are exempt from the requirements of the standard. The standard defines a chemical manufacturer as an employer in Standard Industrial Classification Codes 20 through 39 with a workplace where chemical(s) are produced for use or distribution. In addition, the standard also defines "chemical" to mean any element, chemical compound or mixture of elements and/or compounds. Therefore, any employer who is engaged in a manufacturing operation is considered a chemical manufacturer. Steel coils would be considered a chemical under the Hazard Communication Standard and therefore covered by the requirements of the standard. With regard to the material safety data sheet referenced in your letter (Form OMB No. 1218-0072, more commonly referred to as OSHA Form 174) this is a non-mandatory form developed by OSHA to make it easier for employers to comply with the standard. 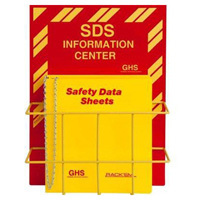 The Hazard Communication Standard does not specify the format for a material safety data sheet but does specify the types of information that must be included. Section II of the above form applies only to the hazardous ingredients of a product. "Hazardous," as defined by the standard, means any chemical which is a physical or health hazard. The enclosed copy of the standard provides definitions for physical and health hazards. All of the remaining sections of the form apply to the product and/or its hazardous ingredients. For example, an employer could put the boiling point for a mixture or just indicate the boiling point for each hazardous ingredient. The "IDENTITY" space provided for on the material safety data sheet is used to indicate the chemical or common name of the product. Whatever identity is used by the chemical manufacturer or importer must permit cross-reference with the label. In other words, the employer is allowed to use any product name as long as the name is the same for both the label and the material safety data sheet. In regard to Sections VI and VII, these items require employers filling out the form to evaluate the hazards of their products. Hazard determination is a requirement of the Hazard Communication Standard. The hazard determination can be made through a review of existing scientific literature. Appendix C of the enclosed standard provides a list of available data sources which chemical manufacturers or importers may wish to consult to evaluate the hazards of chemicals they produce or import. If you need additional assistance you can contact Roy Gibbs or Steven Simon at (202) 523-8036. If I can be of further assistance please feel free to contact me again.